This salad is simply delicious! The Pomelo is sweet and slightly sour. It complements very well with the pan-grilled shrimps. Heat pan over high heat. Add oil and pan-fry shrimps for about 1 1/2 to 2 minutes. Then add the prepared sauce, bring it to a boil. Remove from the heat. 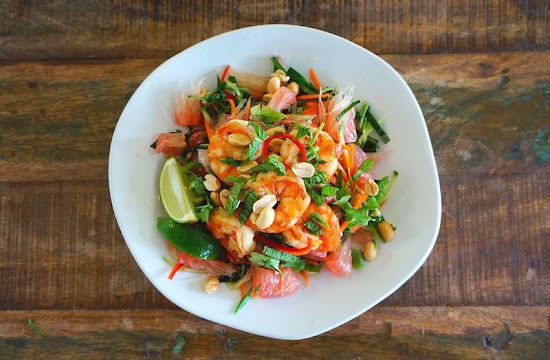 In a large mixing or salad bowl, mix together the pomelo, carrot, cucumber, basil, coriander, mint leaf, Vietnamese mint, red chilli and toss well with the salad dressing. Top with shrimps and some chopped peanut.